At the Johns Hopkins Applied Physics Laboratory in Laurel, Md., mission operations team members (from left) Vince Bailey, Tim Miralles and Becca Horne monitor New Horizons as the spacecraft comes out of hibernation in the early hours of July 12. Early this morning, New Horizons operators gently awakened the spacecraft from the two-week “nap” that marked the mission’s first operational step into hibernation mode. 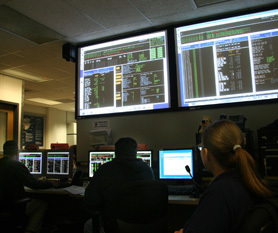 Signals from New Horizons that it had come out of its electronic slumber – during which the guidance and control system and most science instruments were powered off – came through NASA’s Deep Space Network and reached mission operators at the Johns Hopkins Applied Physics Laboratory (APL) in Laurel, Md., just before 2 a.m. EDT. The spacecraft was 550 million miles from Earth, cruising toward the outer solar system at nearly 46,000 miles (74,000 kilometers) per hour. New Horizons entered hibernation mode on June 27. 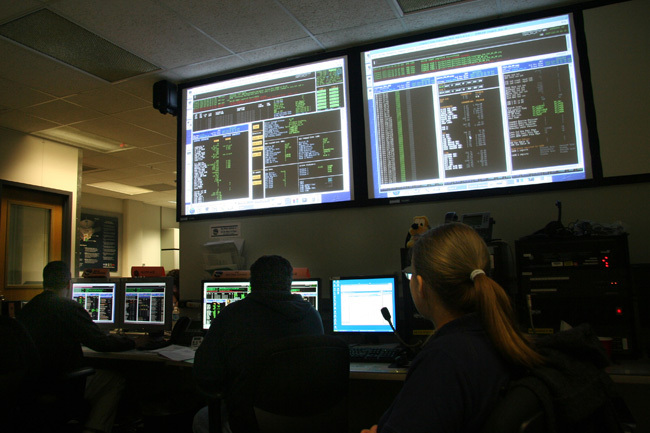 The team monitored its health through a series of coded beacon tones sent home through the spacecraft’s communications system. Hibernation reduces wear and tear on spacecraft electronics, lessens spacecraft-operation costs and frees up Deep Space Network tracking resources for other missions. New Horizons will “sleep” in this spin-stabilized state for most of the remaining cruise to Pluto; operators will wake New Horizons for about two months out of each year for system checkouts and instrument calibrations. Over the next 10 days, the mission team’s to-do list includes uploading a software upgrade for the Alice ultraviolet spectrometer and opening that instrument’s solar occultation port – the last instrument cover to be opened on New Horizons. “The spacecraft needed to be far enough away from the sun, and at the right angle to the sun, before we could open that cover,” Bowman says. New Horizons will go back into hibernation for another month, starting around July 21. Then, from mid-August through early November, the team will conduct the first of the annual system and instrument checkouts.